Discussing and analysing this paint brochure will answer the question, why has the brochure come to be very successful at persuading readers to buy the company's products? 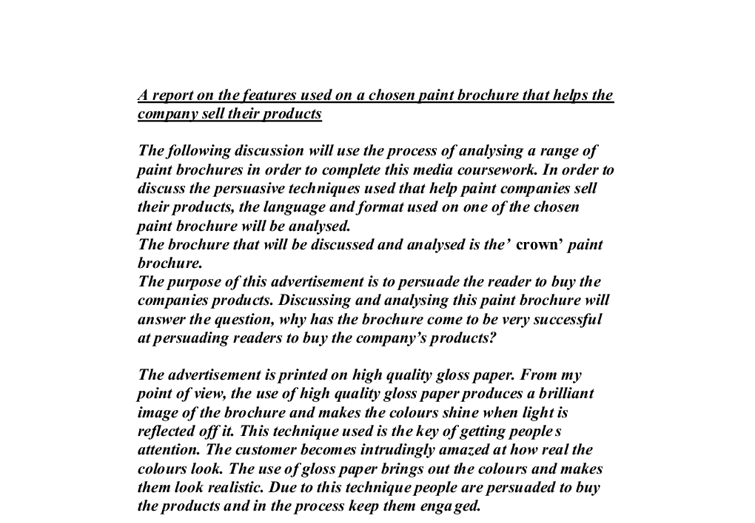 A report on the features used on a chosen paint brochure that helps the company sell their products The following discussion will use the process of analysing a range of paint brochures in order to complete this media coursework. In order to discuss the persuasive techniques used that help paint companies sell their products, the language and format used on one of the chosen paint brochure will be analysed. The brochure that will be discussed and analysed is the' crown' paint brochure. 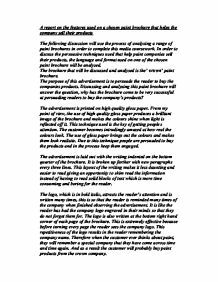 The purpose of this advertisement is to persuade the reader to buy the companies products. Discussing and analysing this paint brochure will answer the question, why has the brochure come to be very successful at persuading readers to buy the company's products? The advertisement is printed on high quality gloss paper. From my point of view, the use of high quality gloss paper produces a brilliant image of the brochure and makes the colours shine when light is reflected off it. This technique used is the key of getting peoples attention. The customer becomes intrudingly amazed at how real the colours look. ...read more. Some information is set out in tables. This ideal way of setting out information in to tables creates a better image of the brochure and what is really important is that the tables present vital information in such an organised way that when the customer reads the brochure they cannot miss the information very likely. Information like hot deals, 20% off, buy one get one free, is very vital to the customer and so it is important that the customer does not miss it or otherwise the high prices of the products would be off putting. Bold italic sub headings and bullet points were used. They are used through out the brochure separating different types of information apart from one another. The use of bullet points and bold italic sub headings provides quick access of information for the customer. If the brochure did not use bullet points and subheadings then it would be time consuming for the reader and seriously off putting to read a solid block of text and by the time you know it the reader has thrown the brochure away. ...read more. Conclusion The crown paint company has set out to persuade the reader to consume the company's products and that is what brochure has effectively done. When the customers buy the paint product they don't just buy paint, they buy a life style as well so the brochure has to be set at high standards to sell paint products effectively and also help the customer to buy the correct paint as well as persuading them, metaphorically helping the customer to buy the correct life style. Which is what the brochure has accomplished. The layout of the brochure along with the techniques used encourage the reader to eventually buy the product, which is what I think the brochure has done. The brochure presents information clearly and in an organised manner. The use of bullet points, sub headings, repeating bold italic logo, tables to present information clearly, co coordinated pictures to give the reader an idea if what the colours may look like on the walls, the gloss paper and the formal persuasive language used all help the brochure to accomplish the task set which is to persuade the reader to buy the paint products and this has answered the question, why has the brochure come to be very successful at persuading the customer to buy the paint products. ...read more. Moreover, in the market, there are always few drink packages designed for particular groups of people, such as the kids. Kids are quite important consumers in the market. It is believed that it is better to design a package with some popular cartoon stars for children to choose. It is all put there for enjoyment, such as go-karting, water parks and golden sandy beaches. A whole paragraph of the text is devoted to clubs and mentions some famous clubs such as "Pacha" and the "BCM". All of the information is very basic because young people will be reading it and they don't really care about sophisticated words. he then bangs the lucozade with the same amount of pleasure, meaning he loves it and it's essential to him The picture of the bottle is shown at the end so that if people want to buy it they will have an idea what it looks like. Why is Coca Cola such a successful company? a few people within the company and kept in the vault of a bank in Atlanta, Georgia. The individuals who know the secret formula have signed non-disclosure agreements, and it is rumoured that they are not allowed to travel together. "Success at Coca-Cola is based on these two dimensions. We have to get our relationships right - with Shareholders, with our business partners, with employees, with consumers in many different cultures and many different places. That means executing a strategy, rooted in relationships where we earn trust by living our values," stated Doug Daft, CEO of the Coca-Cola Company in 2000.
through the books and at adverts and posters the PS2 company have to try and get any additional information about how the PS2 company adds value to its product. This will help to see what sort of advertising is around in order to increase the number of sales the PS2 company has. The club is a non-profit organisation in that any yearly surplus is returned to the racing industry by way of prize money, subsidies, and improved racecourse facilities and amenities (www.ajc.org.au). The Racing Industry The racing industry has had a prominent place in the economic and social history of Australia.